Hey look! It’s a new Desmond t-shirt! “The Constant” deserves special treatment, so I gave my original comic a tune-up for this illustration. I’m REALLY happy with how this turned out. I think it will be my new favorite shirt! Check out a bigger version on my tumblr. When Michael started building the raft I seriously hated the idea. I thought it was ridiculous for a number of reasons. Not only do we know that it won’t work, but Michael would be taking Walt away from the island–one of the most mysterious characters. And then there’s Jin and Sawyer. Sawyer! My favorite character leaving the island? Baloney!! Sure, let Michael go. He causes collateral damage wherever he goes! Then what makes this a favorite moment? The music. Giacchino’s “Parting Words” composition is amazing. AY-MAY-ZING! It gives me goosebumps, my chest tightens, and I get all teary. What a sissy right? Whatever! I’ve seen Sawyer cry and he’s a tough guy cowboy! So thanks to Giacchino I love that stupid raft. “The Constant” is without a doubt one of the greatest things to ever grace the TV screen. It is my personal favorite LOST episode and this is my favorite moment. In honor of this very special episode it’s time for a Twitter contest! If you would like to be entered in a drawing to win a pretty art print of this comic follow me on Twitter (@hellobampop) and retweet this tweet. Deadline for the contest is next week when the next comic comes out. Winner will be announced here and on Twitter! 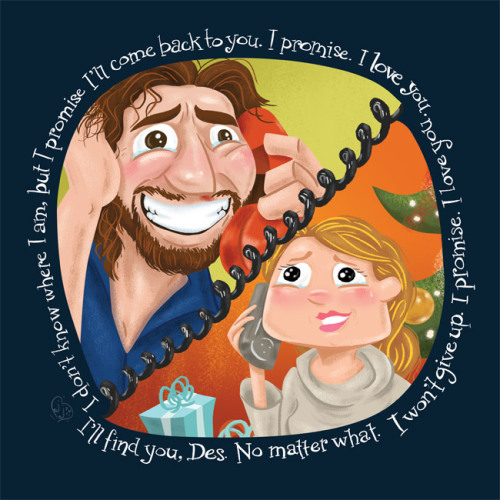 Every now and then, in between the more zany strips, I’m going to illustrate my favorite moments from LOST. Jack and Locke staring down the hatch is totally one of those. Let’s kick this mini-series off with a CONTEST! I am giving away a wicked full-color art print of this comic on beautiful velvet cotton rag paper. To participate is easy! Just leave a comment on this comic. After a week, on Wednesday June 30, I’ll literally put all the comments in a hat and randomly draw one. If i draw your name you win! See. Easy right? So get commenting! Of course you can also buy a print of this or any of the LOST comics. And for every print sold I will plant a tree. No really! P.S. Multiple comments are awesome, but will only be counted once. International friends are welcome, too! UPDATE! (6/24) Thanks SO much everyone!! Reading your comments is amazing. I love you all! Maybe we should make this contest a reoccurring thing! I’m down if you are. The deadline for the contest is the moment the next comic goes up, which is next Wednesday. So until then keep them coming! I will post the lucky winner here on the blog and get in touch over email. If you’re not following the RSS or Twitter already now is a great time to start!